The graphic below clearly shows what President Trump was referring to in the above tweet after he signed a short-term 640-page funding bill known as the Bipartisan Budget Act of 2018 on February 9 that reopened the government by funding it until March 23 following a brief overnight shut down. Before March 23 detailed appropriation bills must be developed into an omnibus spending bill based on a two year budget outline that was part of the Bipartisan Budget Act which added $300 billion in new spending for military & nondefense programs plus $90 billion in disaster relief aid. 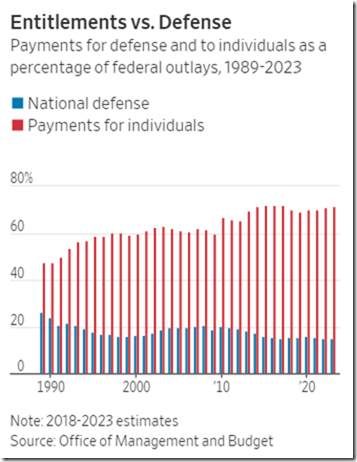 Note: in the graphic below federal government payments to individuals (69.2% of the federal budget in 2019) are well over 4 times larger than payments for national defense (15.6%). Net interest on the national debt is 7.4% of the federal budget in 2018. 69.2+15.6+7.4 = not much left for other programs going forward meaning deficit spending will continue as far as the eye can see. The following graph shows the growth of federal government payments to individuals – 71.3% of the total 2016 federal budget was dedicated to payments to individuals, up from 28% in 1966. Click here to hear part of Rand Paul's excellent protest to deaf ears in the Senate on the evening of February 8 & the early morning hours of February 9 pleading for his colleagues to show some financial responsibility. In summary Senator Paul says "The bill is nearly 700 pages. It was given to us @ midnight last night & I would venture to say no one has read the bill . . . the dirty little secret is Republicans are clamoring for military spending but they can't get it unless they give the Democrats welfare spending so they raise all the spending, it's a compromise in the wrong direction . . . when Democrats are in power Republicans appear to be the conservative party, but when Republicans are in power it seems there is no conservative party." In brief, the budget bill lifts the sequester spending caps that were put in place in 2011 to control both defense & non-defense spending with all of the money agreed to earlier this month ($390 billion) adding to the deficit which may now exceed $1 trillion in the next two years. The Treasury Department shows the national debt increased under GW Bush from $5.73 trillion in 2001 to $10.63 trillion when he left office in January 2009. BO took the national debt from there to $19.95 trillion. As of February 6 the official debt of the United States government was $20.5 trillion. In June 2017 the Congressional Budget Office projected the national debt would rise to $30.7 trillion by 2027. The federal government divides the national debt into two main categories: 1) $14.8 trillion in publicly held debt like that held by individuals, corporations, local governments, & foreign governments like China, & 2) $5.7 trillion in intergovernmental debt which is owed to special funds like the Social Security Trust Fund. 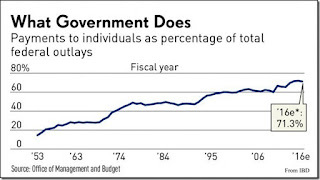 The national debt is sometimes called the Federal Debt Held By The Public (see graphic below) to distinguish it from the debt totals that include unfunded liabilities tabulated @ the close of fiscal year 2016 like: 1) $8.5 trillion in unfunded liabilities for federal employee retirement benefits & other miscellaneous unaccounted for items, 2) $29.0 trillion in obligations for current Social Security participants above & beyond both projected revenues from their payroll & benefit taxes & the IOUs in the Social Security Trust Fund, & 3) $32.9 trillion in obligations for current Medicare participants above & beyond both projected revenues from their payroll & benefit taxes & IOUs in the Medicare Trust Fund. Accordingly, @ the end of fiscal year 2016, the federal debt held by the public plus the unfunded liabilities detailed above comes to $84.3 trillion after subtracting the value of assets like cash on hand. The enormity of the above debt figures is incomprehensible to even the 1,000 richest men in the world combined as far as visualizing the debt's magnitude compared to anything any human being has ever grasped. The above statistics are from the excellent work done by Just Facts. Over six years ago I presented four solutions to problems like the out of control spending problem described above. The last two posts have re-presented the solutions specifically for Social Security & Medicare which were the first two points of the post Four Points Highlight The Needed Change In Mindset made on January 31, 2012. The third point of the aforementioned post specifically addressed budgetary matters; namely, it endorsed the "cut, cap, & balance" plan of Ken Blackwell & others in which federal spending would be controlled so that projected borrowing is cut in half the first year (not 10 years from now), spending would be capped @ 18% of GDP - the norm of much of the past 65 years - (it's 21% of GDP now with a projected deficit of 4% of GDP this fiscal year), & under a balanced-budget amendment the president would be required to submit a balanced budget within the foregoing spending guidelines that call for super congressional majorities to raise future debt limits or tax rates. The balanced budget amendment part of the plan would work hand in glove with the cut & cap parts of the plan – i.e., you need all three in order for it to work. Professor Friedman taught that he is more worried about how much money government spends than he is about deficits & the cut, cap, & balance plan meets his test. 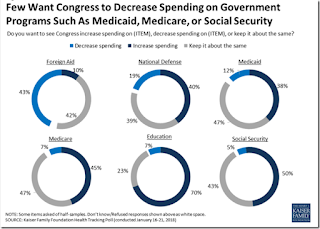 But the Congress has shown no appetite for cutting anything or living within the means of a spending cap that is 3% of GDP lower than the current level of spending. Senator Flake points out above that Congress is only good @ spending more money than they have. Students of economics know that the budget is always in balance from an accounting standpoint – there is no such thing as an unbalanced federal budget. The staggering numbers of the deficits & national debt resulting from out of control government spending really mean that there will be a less robust economy especially for younger & future generations. And younger generations don't understand this because they have been taught a sanitized history with regard to socialism – a history that leaves out the fact that socialism has failed dramatically, often disastrously, everywhere it has been tried. A recent study found nearly half of all Millennials said they would rather live in a socialist or even communist country than a capitalist republic with heavy reliance on democracy – like the U.S. Witness Bernie Sanders, an avowed Socialist, who received overwhelming support from young people in the 2016 Democrat Party presidential primary – receiving nearly three-fourths of the total vote of Millennials (18 – 29 year olders). Source: Hillsdale College. 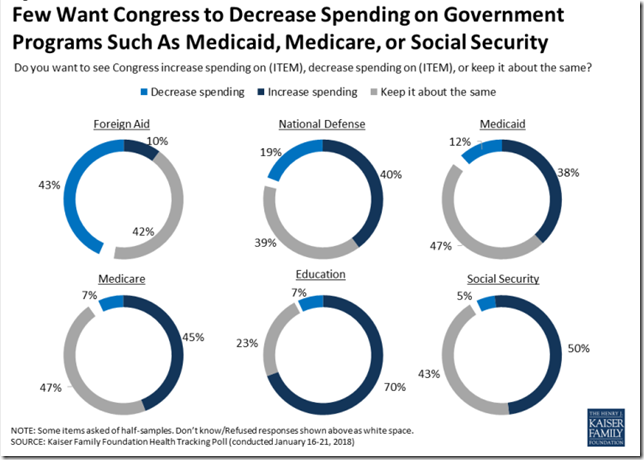 The following graphic from a Kaiser Family Foundation survey in January shows 50% of Americans want more spending on Social Security & only 5% want less; 45% want more on Medicare & 7% less; & 38% want more on Medicaid & 12% less. Every indication is that the majority of Americans want more government – in fact big government. But as a reader of RTE you know better. What you do with the insight you have gained is crucial to the future success or failure of our country. You have got to be kidding me! No criticism of Trump on the massive tax bill, instead you use one of his stupid tweets about how the answer is to elect more Republicans if you want a better bill. This tax bill is an abomination and Trump is a complete and utter failure at everything he does. He's also a sleazy, sickening person. I can't wait for November or until he goes to Jail, whichever comes first. Jail? Jail for Clinton who allowed 20% US uranium to Russia - clear fact. Clinton destroyed 33,000 emails after Congress subpoenaed them and MostCrookedComey let CrookedHilary off. US has become a banana republic and our AG is an utter failure. Trump campaign was grave threat to Russia lucrative oil economy and military build up-Russia’s 2 top priority. Y would Russia want Trump over anti oil anti coal dovish Clinton? Sir- can you answer this ??? The Left concocted this BS covering up for their own Russia collusion - damn Dossier. 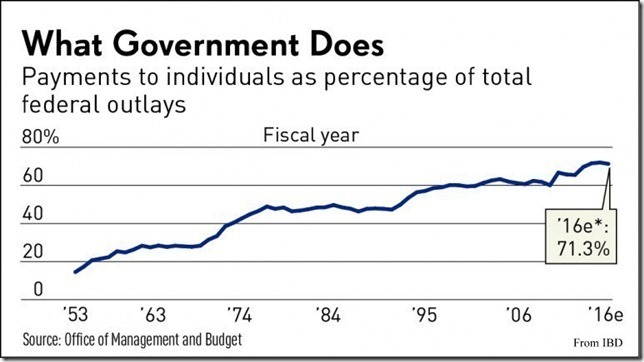 graph that shows the growth of federal government payments to individuals – 71.3% versus 28% in 1966 is most telling. It correlates perfectly with onslaught of Treasury resources with War on Poverty. I believe over $15 trillion was spent on that War but results are total failure - virtually no change in poverty rate. Instead a deep Dependency on Government class grew to point that Democrats continue to propagandize all except top 10% very wealthy are victims of these 10%. Democrats want to keep a very large Dependency on Government class for a super majority electorate. This is a sham and we need prominent, brave Conservatives to call out the Left on what really is a racist policy - keeping minorities thinking they r victims so the Left can win elections.